My Great grandfather was Frederick RICH, and he worked at the Keynsham site for JS Fry and Son from about 1896 to about 1942. He married a CHAMBERLAIN and had children. I only know about one who was Peter RICH, my grandfather. They lived in the area. Peter then went to Egypt in 1930 to work for the British Powdered Egg Company Limited, where he worked in supply. He then entered the RAF whilst he was in EGYPT, and ended up in the supply side. Frederick started in the accounts department of JS Fry, where he worked for 18 months, and was then moved to the transport department, where he worked for the rest of his career. He ended up as director of all transportation for all of the Fry company and was responsible for the running of the Keynsham site. During this time the company went from Horse and Cart to motor vehicles. 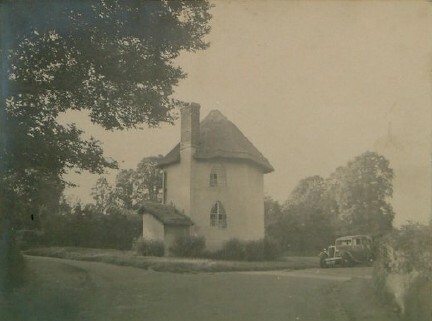 The Tollhouse at Stanton Drew in the early part of the last century. If anyone has any further information on the Tollhouse I'd love to hear it. See our Stanton Drew page for more information on the Toll House and the families who lived there.